Some artists thrive using established techniques while others enjoy experimenting with new methods. History points a finger at the influence of mirrors and lenses in the 15th century. And in 1502 Leonardo described the camera obscura that changed the way artists understand perspective. Turner was interested in the new invention of photography in the late 19th century but was rather dismissive because it lacked colour. David Hockney has had recent shows of paintings created on his Ipad. My own new body of work consists of a collection of acrylographs on canvas. I am interested in the acrylographic process, which is an exciting development in picture making. 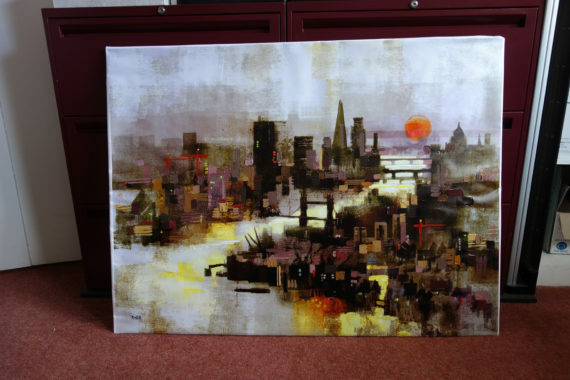 It is a hybrid of acrylic painting, archival inkjet printing, and digital image control. These three processes have all impacted the art scene and my art career over a fifty-year period. And they all combine to make acrylographs. Acrylic paint came in while I was a student in the very early sixties. My art college was approached by an importer of this revolutionary new type of artist’s paint. Acrylic resin-based paint could be applied like oil paint or watercolour paint they promised. The artist could thin the paint with water instead of turpentine, so the paint dried very fast and the studio was free of toxic flammable fumes. They offered selected senior students free supplies of acrylic medium that would mix with artist’s pigments so that we could to make our own paint and report our results. A couple of us jumped at the opportunity to be the first UK guinea pig artists to use this novel medium. We relished the fact that it was free for us as we explored the possibilities. We discovered surprising effects when using the techniques of scumble and glaze, thin washes, palette knife work, and collage using the glue-like paint. We found that we could paint onto canvas, paper, or board, and it was ideal for outdoor sketching as well. Acrylic paint is now widely accepted and understood. The speed of drying has definitely influenced artist’s over-painting technique and acrylic paintings are different, studios cleaner, and artists healthier. Archival inkjet printmaking evolved at the start of this century from early giclee print technology coming into Europe from California a few years before. Until then traditional individual printmaking required the artist to create wood-blocks, plates or screens for etching, engraving, silkscreen etc, one colour at a time. 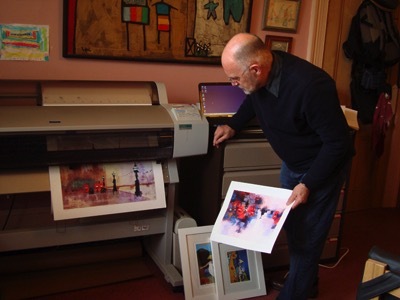 These worthy techniques are still in use by artists to create original prints, but they are very time consuming when making multi-coloured original prints. They are also unsuitable for publishing reproductions of multi-coloured paintings. In those days the art publishing business was dominated by a few large publishing companies, who concentrated on producing safe and profitable images. It involved huge investment in printmaking systems using monster lithograph machines. Giclee offered full-colour print runs in stunning quality. The fugitive nature of the very first giclee prints was overcome by Japanese machinery and the creation of inks using real pigment instead of dye based colour. As the later print machines became available and even affordable for individual artists I adopted the artform with relish. I experimented and reported to the fine art media and business organizations, and became involved with The Fine Art Trade Guild in adapting international trade standards for the new technology. I was an eager user and experimenter with early giclee because it seemed to offer the possibility of affordable high-quality print on demand. PoD meant that an artist could make full-colour print reproductions one-by-one whenever required. The ability to create a portfolio of archival prints that could be printed individually on paper or canvas whenever someone wanted the item was a business bonanza! It meant that artists like me could self-publish large portfolios of images catering for niche markets without the need to gamble on huge stocks or storage. We had a fine art publishing revolution providing quality, efficiency, and affordability. The third major component of this holy trinity has been digitalization technology using computers. High resolution digital cameras are now very affordable overcoming the expensive scanning problem that prohibited top quality image capture just a few years ago. Images can now be scanned, stored as digital files, and shared in the clouds so that they can be transported over vast distances at the drop of a hat. The power inside a modern computer can take a huge digital file and allow an artist to manipulate the properties of the image at will. Factors like colour selection, over-saturation, de-saturation, copying, cropping, flipping, layering, and most importantly a back button so that experiments can be tried and undone in a moment. An artist can create new pictures on a computer screen with a mouse, or, like Hockney, with fingers or pens on a tablet or a phone. An artist can photograph a subject and use the digital image as a part of a new creation, or digitally capture an existing painting or paintings and manipulate the file to develop new artwork. One such development that I have discovered is that I can re-deploy older images and update the content to reflect the latest reality. This applies to landscapes where there is ever-changing colour, tone, light and shade created by weather and time of day. And that is especially relevant for my cityscapes based on the dynamic London skyline where new buildings and architectural adventures are visible almost every day. Acrylographs are a combination of these three elements and this is what my latest work is all about. I am painting pictures using acrylics and photographing the image before manipulating in Photoshop on my computer. I print it onto canvas using archival inks then over-paint with more acrylic texture and paint to make a new individual canvas artwork. There are outcomes that I can get on the computer and other effects that I can get in the studio with real paint. These results are different, and the combination is new and radically progressive as well.